Now that the Truth and Reconciliation Commission of Canada has completed its work, and the major federal political parties have have adopted predictable positions, what can ordinary folk do to make sure Justice Sinclair’s message isn’t lost between now and the election this fall? I’m rather taken with a draft Act that was made public yesterday on the steps of the Manitoba Legislature that would set aside one day a year, called Manitoba Indian Residential School Genocide and Reconciliation Memorial Day, to reflect on and reaffirm our commitment to truth and reconciliation. Educate all Canadians about the Indian Residential School experience. The use of the word “genocide” makes this is a provocative name for a provincial holiday. It is precisely the provocative nature of the word that makes it so valuable. Most Canadians are in a state of denial regarding the injustices perpetrated against indigenous peoples and badly in need of some straight talk. 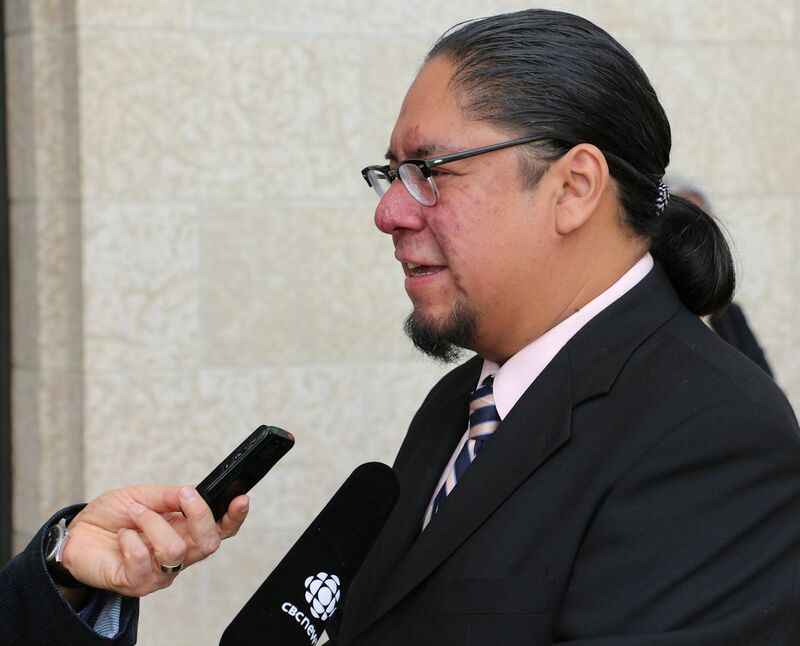 I recorded Maeengan’s launch of the Act, following him through the halls of the Manitoba Legislature to capture the responses of representatives of four political parties. I’ve also (see below), published the draft Act. I hope the Manitobans reading this post will get behind it and get in contact with their Members of the Manitoba Legislature. Wouldn’t it be cool if Canadians in other parts of the country tried to beat us to the punch and get similar laws enacted in their provinces? WHEREAS between the years 1870 and 1996, 150,000 Indian, Metis, and Inuit children in Canada were removed from their families and communities to attend residential schools. WHEREAS, the ‘Prevention and Punishment of the Crime of Genocide’ (adopted by Resolution 260 (III) A of the United Nations General Assembly on 9 December 1948, includes “Forcibly transferring children of the group to another group,” and the actions taken to remove children from families and communities and to put them in residential schools meets this definition of a “genocide”. WHEREAS the goals of the Indian Residential School system were to “remove and isolate children from the influence of their home, families, traditions, and cultures, and to assimilate them into the dominate culture”. WHEREAS the Government of Canada recognized that many of the children experienced emotional, physical, and sexual abuse, lived in conditions of neglect, and were forbidden to learn, or practice, their culture, and to speak their language. WHEREAS on June 11, 2008, the Government of Canada made a Statement of Apology – to former students of Indian Residential Schools to initiate healing and reconciliation between the Aboriginal community and Canada. WHEREAS efforts have been launched nationally to lead to reconciliation including the Indian Residential Schools Settlement Agreement and the Truth and Reconciliation Commission of Canada. WHEREAS on June 2, 2015, the Truth and Reconciliation Commission of Canada recognized the establishment and operation of residential schools was a central element of assimilative policies that can be best described as cultural genocide. WHEREAS the Truth and Reconciliation Commission recommended that the United Nations Declaration on the Rights of Indigenous Peoples be the framework for reconciliation at all levels and across all sectors of Canadian society. d. To educate all Manitobans about the lessons of the Indian Residential School system, and its continuing impacts in today’s society. WHEREAS the Legislative Assembly of Manitoba is committed through legislation and education, to support the revitalization of Aboriginal communities that enable Aboriginal people to reach their full potential, and to bridge efforts of reconciliation of Aboriginal people and the people of Manitoba. WHEREAS on June 2, we will remember, for we must never forget. In each year, June 2, to be known as Manitoba Day for Understanding and Reconciliation in Relations to the Indian Residential Schools.